From the enigmatic beginning to its surprising ending, Bangalore Baloney is a story of an enduring friendship that spans three decades and two continents. Swami and Venu are students in the 5th standard at Baldwin Boys’ School in Bangalore when George arrives from New York and joins their class. The three boys soon become good friends and call themselves The Scrimshankers. The novel follows the lives of these three characters... from their school days, first sexual experiences, and personal tragedies... to the separate paths they each take to pursue their dreams. Swami grows up to become a fearless journalist and newspaper publisher. George plays guitar, sings and writes songs from a young age. His journey takes him back to the U.S. After a traumatic childhood, Venu manages to get into a top medical college against all odds and ends up in Canada. After being away from each other for many years, a dramatic event in New York brings the three friends together once again. They realize the true depth of their friendship and how important they are to each other. 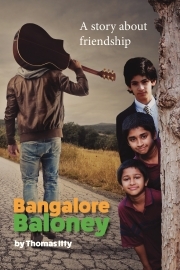 Bangalore Baloney is an exceptional work of fiction that is easy to read but profound in scope and content. Filled with subtle humor, vivid descriptions, universal experiences, heart-tugging moments, action and suspense, as well as 16 great songs (available on the author’s website), this is a novel that sets new boundaries in multi-cultural literary fiction and music. Thomas Itty is a writer, musician, songwriter and marketing professional. He attended Bishop Cotton Boys’ School in Bangalore and began working as an advertising copywriter when he was just seventeen years old. He started his own advertising agency, The Ad-Pad, when he was twenty-two. A few years later, he left for New York City to continue his education. Since then, he has completed a Bachelor’s degree in Communications Arts, a Master’s degree in Media Studies and an MBA in Marketing Management. Thomas has worked in the New York region as a creative director, media specialist, marketing manager and business development manager for over twenty years. He currently lives in Westchester County with his wife Barbara and their children, Nathaniel and Alexandra. Bangalore Baloney is his first novel. Please visit www.thomasitty.com to listen and purchase songs featured in Bangalore Baloney. All songs are written and performed by Thomas Itty.